From scintillating beauty, exquisite cuisine, simple yet enchanting clothing and beautiful jewellery, Kerala has it all. 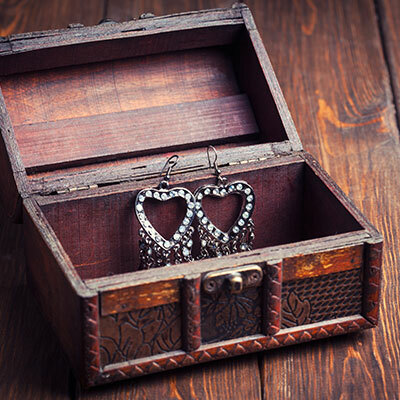 The simplicity, purity and freshness of its surrounding nature can be seen in its clothing and jewellery trends. Here’s everything you need to know about the traditional clothing and jewellery of Kerala. The people of kerala wear simple and subtle clothes. 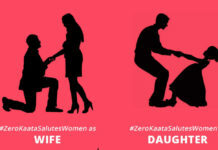 ‘Mundum-Neriyathum’ is the traditional attire for women in Kerala. It consists of a pair of cloth pieces. 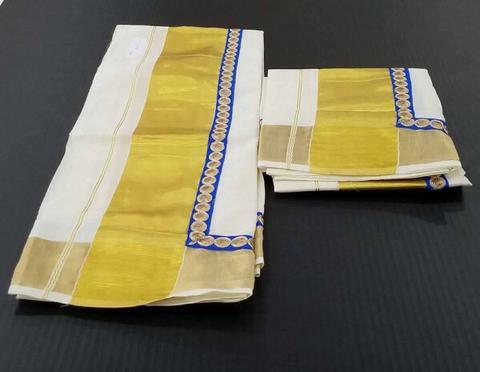 One of them is worn around the hip on the lower portion of the body, reaching the ankles while the other is worn on the upper part, with a blouse with its one end tucked in the lower Mundu at the waist and another coming through the shoulder, resembling a saree. It is usually made in white color and has zari embroidered borders. Kanchipuram saree is made of Silk and is usually adorned by a Hindu bride at her wedding. Kanchipuram sarees are woven from pure mulberry silk thread. It has distinct border colors and designs which are different from the body. 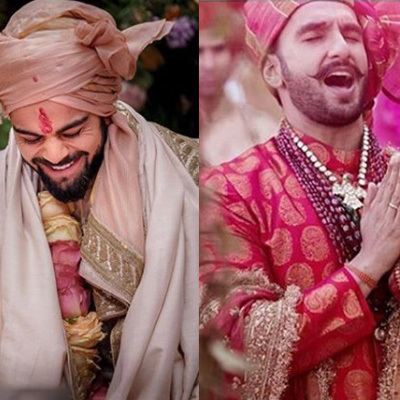 The saree worn by the bride at her wedding is crafted in either zari or Gold thread. Some women prefer to wear bright colored Kanchipuram sarees. Kanchipuram saree Sarees are distinguished by their wide contrast borders. The famous borders are made with the intricate Temple, checks, stripes and floral designs. The cost of Kanchipuram sarees varies widely depending upon the intricacy of work, colors, pattern, and the material used. Kerala, the land of greenery, beauty and coconuts is famous for its art, exquisite cuisines, beautiful dance forms, enchanting jewellery and clothing. Kerala has a rich and diverse culture, influenced by the religions of Hinduism, Christianity and Islam. 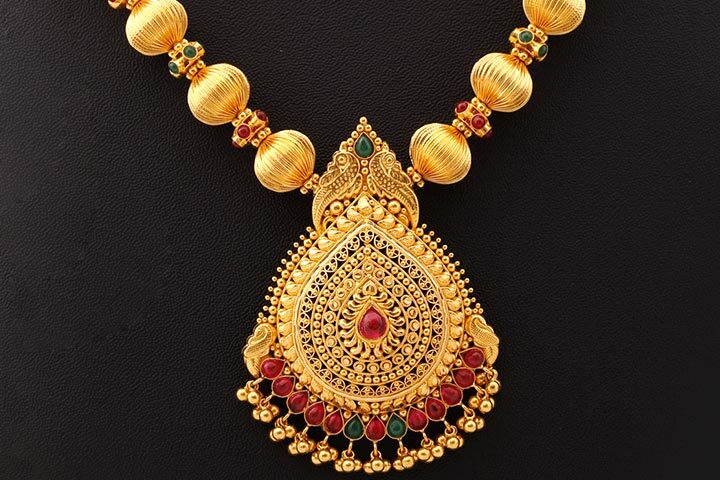 The traditional jewellery of Kerala is made of pure Gold and is famous for its exquisitely skilled craftsmanship. 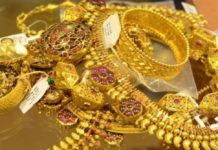 The glittering Gold jewellery of Kerala reflects the dignity of rich Indian culture. 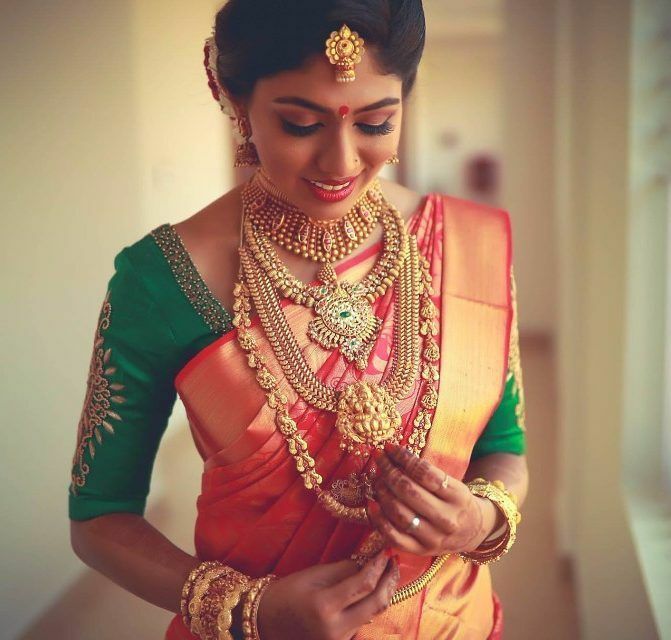 Here’s everything you need to know about the traditional jewellery of Kerala. A typical Manga mala necklace is made of small paisley shaped mango-shaped pendants and is the most common jewellery adorned in Kerala. It depicts the rich traditional heritage of Kerala. 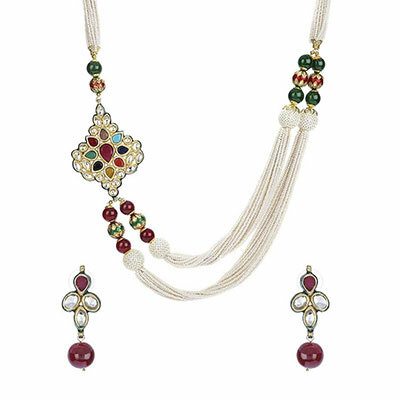 Jasmine buds necklace or the Mulla Mottu necklace consists of a series of jasmine petals, stranded together in a form of a necklace. 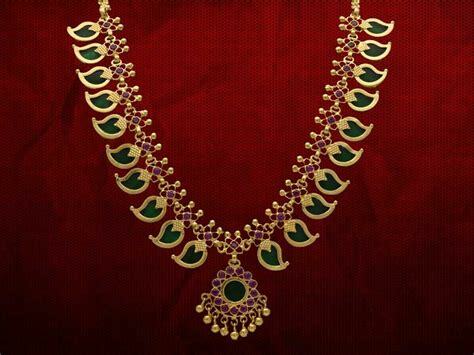 This traditional Kerala jewellery piece has two types of designs. The one with the plain gold over and the second one with a combination of gold and studded gemstones. Pulinakham is made of glass stone. Pulinakham stands for the nails of a Tiger, therefore, Pulinakham Mala is consists of the glass stones crafted in the shape of the tiger’s nails. These are strung together to form a beautiful traditional Keralan design. This classic jewellery is usually adorned by Keralan women with the traditional Keralan saree. 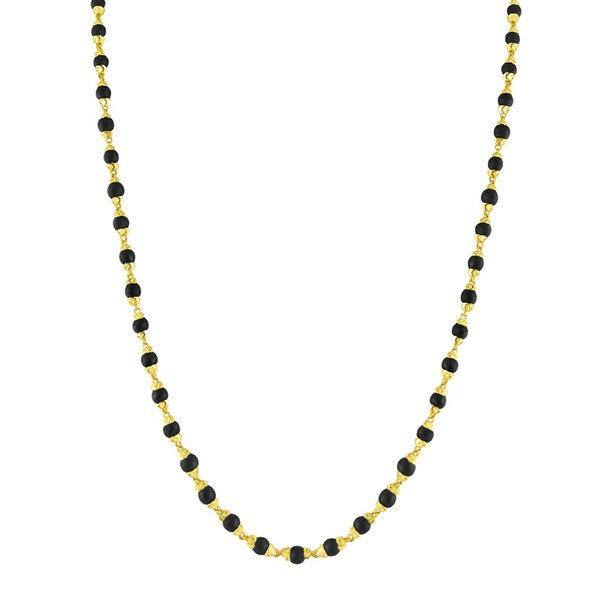 Similar to Mangalsutra worn by North Indian women, Karimani mala is made up of black and gold beads and is often worn by married women in Kerala. 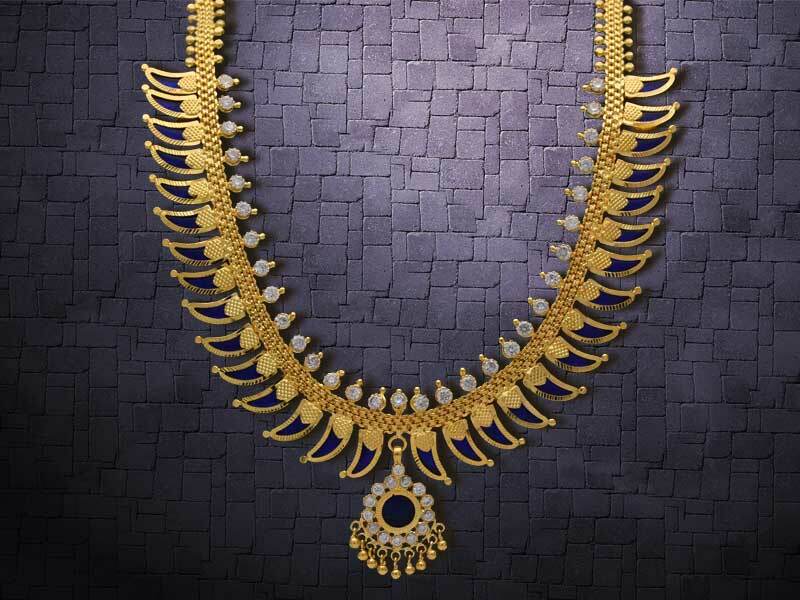 This traditional piece of Keralan jewellery is crafted in Gold. 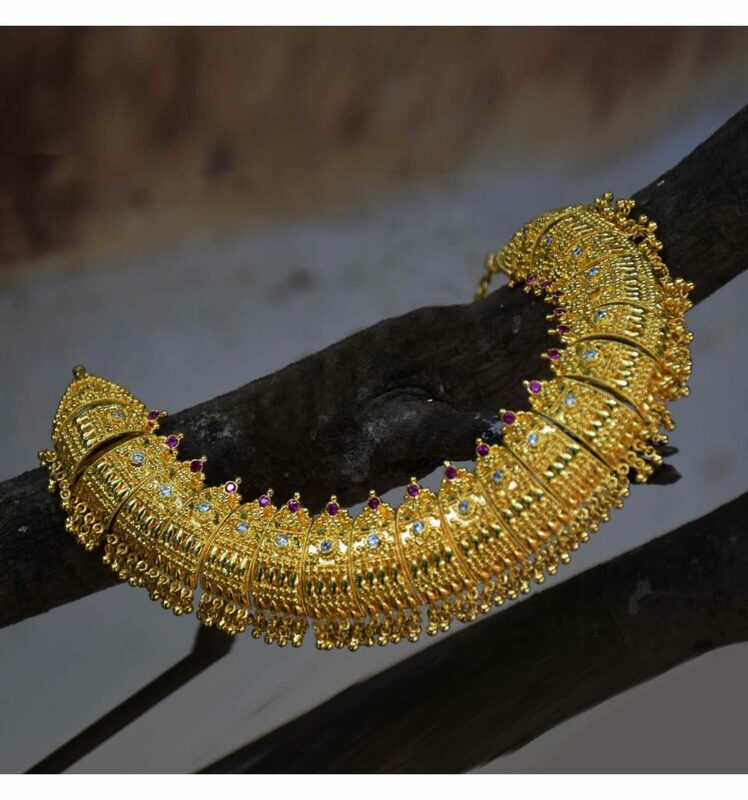 ‘Kasu’ stands for coins and ‘Mala’ stands for a necklace, therefore Kasu Mala is crafted with a lot of coins which are strung together to give it a rich royal look. These coins are embellished with the symbol of Goddess Lakshmi, therefore it is also known by the name of Lakshmi Haar. 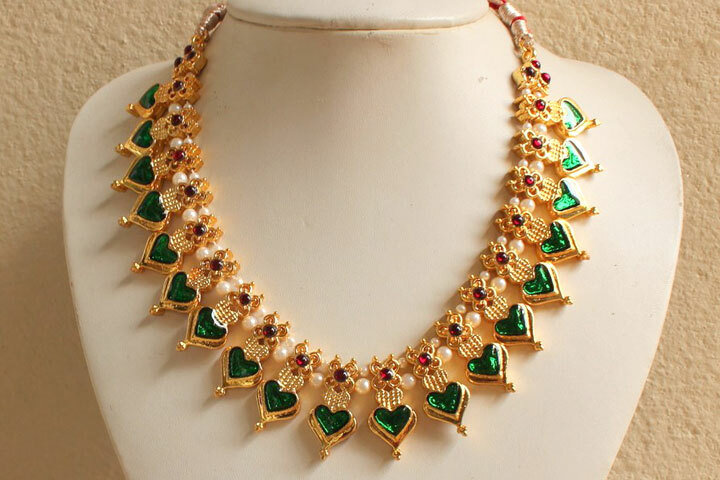 Green in color, Palakka Mala is a ‘leaf’ necklace consisting of either emeralds or imitation green stones. It is also made with a combination of emerald and ruby stones. The design usually resembles a leaf having a gold border. It is one of the oldest traditional Keralan designs and resembles the hood of a snake which is why it is called Nagapada Thali. 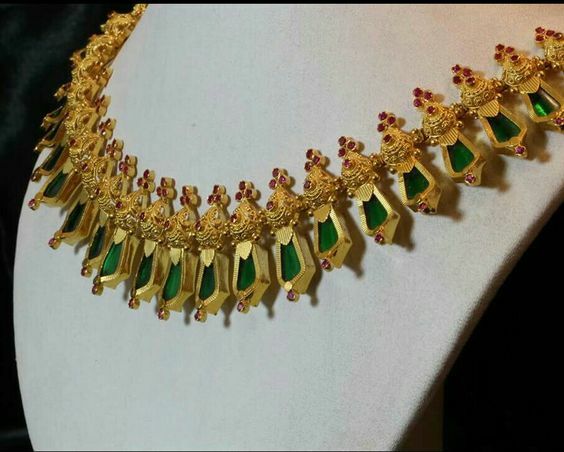 It consists of green colored stones or emeralds/rubies strung in a Gold chain. 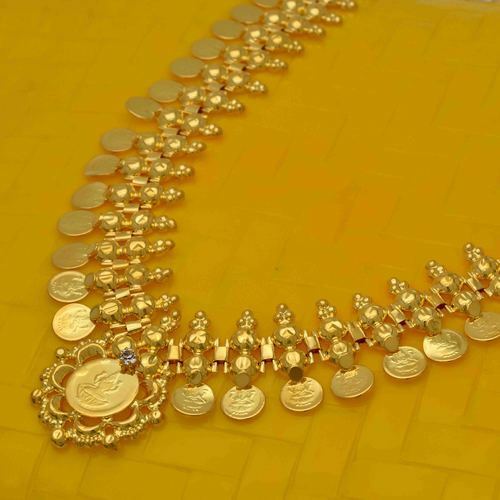 Pathakam consists of a Gold pendant in a Gold chain. 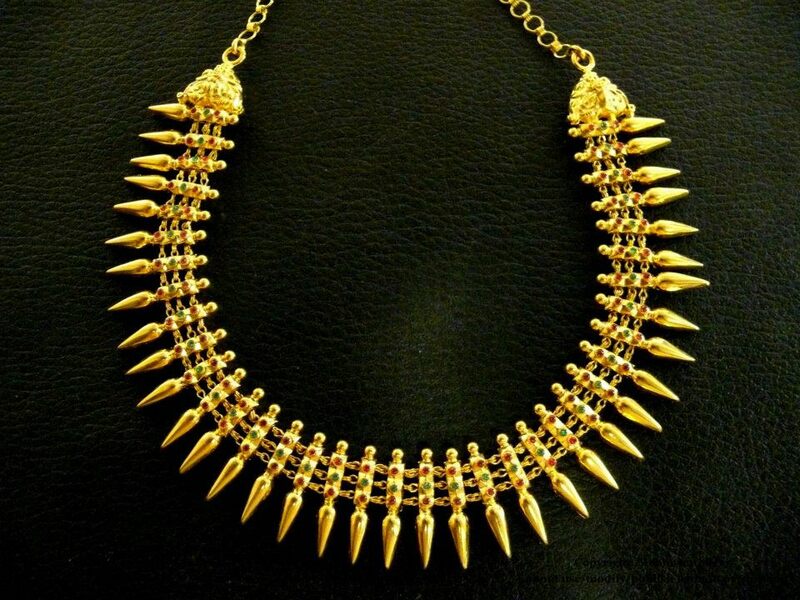 This beautiful piece of traditional Keralan jewellery is either made in pure gold or is studded with the stones. 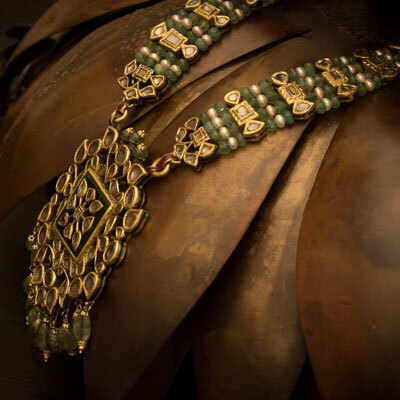 Poothali is made with the nature-inspired patterns and designs. It consists of rectangular pieces which are crafted with intricate flowers and leaves. It has dangling this from each piece which adds a glorious touch to an overall appeal of the necklace. 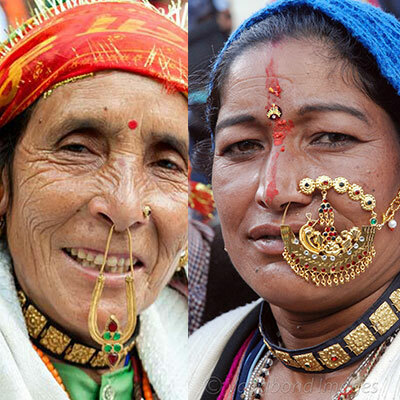 A ‘Kolusu’ is a Payal adorned by girls and women on weddings, religious and festive occasions in Kerala. Traditionally made in silver, Kolusu is available in gold as well. 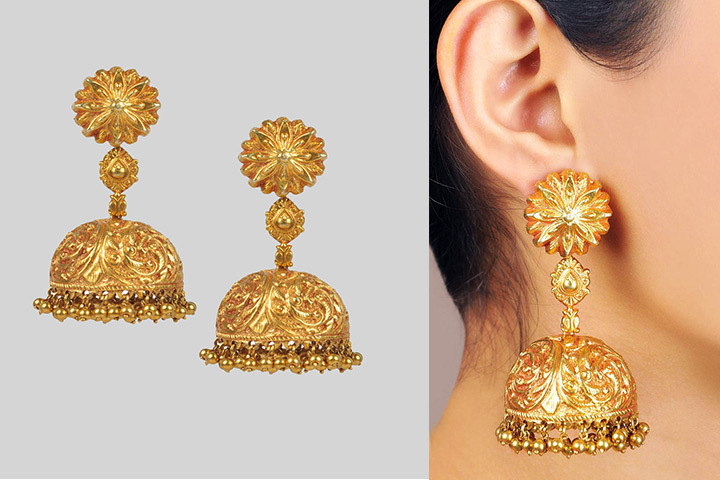 Traditional Jhumkis or jhimkis are the traditional bell-shaped designer earrings, adorned by the bride in Kerala. 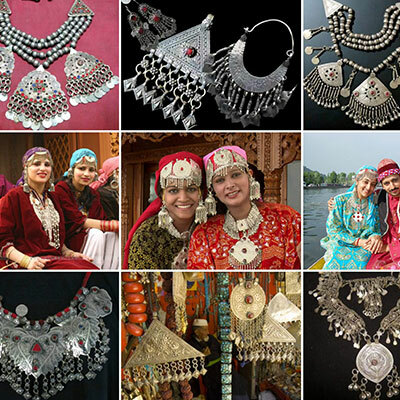 Jhimkis or Jhumkis form a part of the temple jewellery. It is crafted in two types of designs. 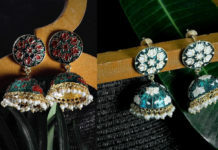 First one is all about ear studs in palakka (leaf) and the second one is a gold-plated earring embossed with small dangling bells. 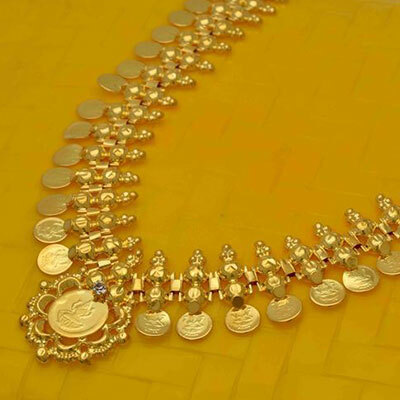 Elakkathali is an important part of traditional Keralan wedding jewellery. 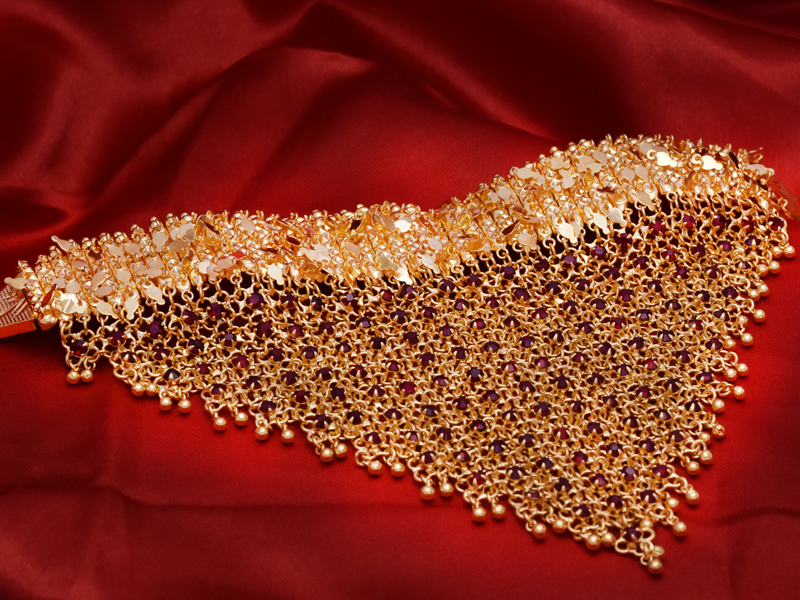 Elakkathali is a heavy choker necklace worn by the bride during her wedding. Made of Gold, it is crafted with intricate designing and requires exquisite craftsmanship. 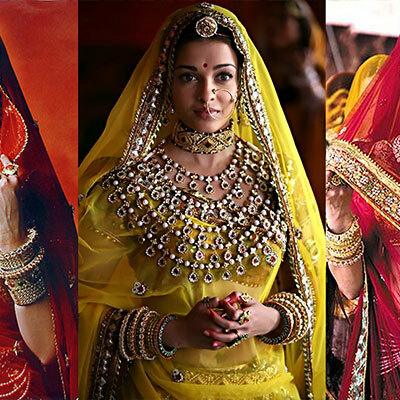 Which type of jewellery did you like the most? Drop comments and let us know your favorite pick. 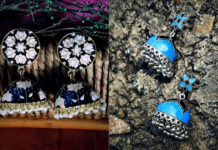 Next articleFree Jewellery With Every Order; END OF SEASON SALE!